Gameplay: Installation of the game comes in 2 CDs. Gameplay does not require CD in the CD-Rom drive. The main menu has new game, load, save, picture gallery, credits, options and quit. The picture gallery replays cutscene and additional graphics are added as bonus points are accumulated. The options menu has choices for rendering - hardware or software, speed - slow, normal or fast, subtitles and volume adjustment. At bottom right is the return or back to previous page. The ESC key accesses the main menu during gameplay where you can save-load games. You can overwrite on a saved game by clicking on that saved game and replace it with a new one. Right click skips the intro. There is a health bar at bottom left to show how much energy the character has until full health is obtained. Right click of mouse accesses the inventory menu. Collect items by left click of mouse on the items. They will be stored in the transit area (right top of screen) of the inventory menu and seen by a graphic of the item at top right of the screen and description of the item at bottom of the screen. The items have to be transferred from the transit area to the inventory slot (top squares) in order to be used. This can be done individually or all items by using the 'auto button'. Once an item is selected, it will change to be the cursor. Right click or click the back button to go back to gameplay screen. Move the cursor to show description of each area in the inventory menu. At top left is return to menu, phone that can call, access news or GPS and objective shows the journal entries. There is also an encyclopedia available when the phone is functional. The middle pipe like area is used to combine items. Select an item and click it over the combining item. It will be seen at this area. To separate a combined item, place the combined item (shown with a wrench icon) on the dismantling area. Under the Auto transfer frame is the slot for Jep, the monkey. He can be combined with items in inventory to enable him to do certain actions. Thanks also to DrumBeat for additional help! I'm alive: I'm Mina. I'm being watched. Notice the shadow over Mina. I'm feeling weak. I need to find something to eat. NOTE: The game is non-linear and steps can be done at anytime with no dead end problem. There are instances that more than one solution to the puzzle is available. I will try to note this as the walkthrough goes along. I might miss some alternative solutions. The game counts points for actions done. Right click to show the inventory bar. Click on phone at top left white frame. Click on phone icon - the batteries are too low to send an SOS. Beach - Look down from sky, turn around 180 deg. and go to the cliff. See a man ghost above the cliff. Climbing up is not a recourse yet. Look down and pick up rusty key +1. Turn right and look up to the nest on the ledge of the cliff. Take bird's egg+1. Right click to access inventory and click on egg. See a description below that it is inedible raw - to be eaten cooked or used in other dishes. Click hold of the items in the transit frame and place them in the inventory square slots. Look up and see another bird's nest that is 'too high'. Turn around, go towards arch and look at the wreck of a boat. Click on the hull - biggest wood and it is 'rock solid'. Pan right and pick up the wet seaweed +1 on the sand. Stone Arch area - Go forward under the arch, look down on the left and see a trapped fish. We can't get it yet. Look up and take 3 oysters +3 from the wall of the arch. Take the oyster at bottom of large pole in front of the wall. +1. You can get another oyster from the post on the left but it will be given later in the game after a cutscene. Go forward 1x pass the arch and see a turtle going back to the water. Turn right and pick up lichen +1 from the rock. Turn around towards the beach and look down. Click on sand at end of the trail marks on the sand. Pick up 2 turtle eggs +1 and see a chest. Click on chest. Use rusty key on chest. Wow! Take damaged telescope +1 and silver coins+1. Let's take a look at where the turtle was. Go towards the palm trees and hear 2 thuds from the palm tree area. Look down to see a sand covered turtle nest. Click on sand mound at end of the turtle trail and pick up 2 turtle eggs +1. Go forward to the palm trees and see a porcupine dead under the coconut trees being eaten by 2 crabs. 'Ouch'. Wait until the 2 crabs +2 are feasting on the porcupine and then click on the body to 'gotcha'. Pick up the dead porcupine +1. Pan left, pick up the palm tree +1 leaves and the green coconut +1.That's the thud you heard. Look up and see coconuts that 'need to be a monkey to get up there'. Turn around and pick up the dried brown coconut. +1. Let's go back to the arch. Thud! That was a near miss! Pick up the green coconut +1 that just fell in front of you. Inland path - Go through the arch, pan left, forward and go to the inland path. Stand on the large rock on the sand floor and feel the earth move. 'What a strange noise.' Look at cliff on the left of the inland path and go forward to the small cave. Pick up the flint +1 and sandstone +1. Look at the blackened spot on the ground and the soot on the wall. Go back to the boat wreck. Take the sandstone rock from inventory and use it on the wood hull. Take rusty metal +1 and driftwood+1. Place all picked up items in inventory slots by clicking on Auto button. In inventory, click the sandstone rock on the rusty metal taken from the wood hull. See the sandstone + metal = knife. Now we have a knife+1. Now we have the essential tool in adventure gaming. If the knife breaks, you can always make a new one with another metal later. Go forward twice towards the inland path and look down. Pick up metal plaque +1. In inventory, the description of the metal plaque states - Nautilus 1860. Pan straight up and see a branch. It’s too high to reach. Pan up and see thorny vine on the right. Pan up and see thorny vine on the right. Take the knife from inventory and use it on the vine to get Acacia thorns +1. Pick up the pink worms +1 at left side of path. Go up to the top and see a green vine hanging over a log. Use the knife on the vine and get thin vine +1. See logs that prevent passage. You need to eat first to get your strength back up. Take the Amadou +1 (highly flammable fungus) from the post on the left. Look down and pick up the forked branch +1 from the base of the left post. Turn around to go back down to the beach. See rusty pieces of metal embedded on the rock wall. Go to the place where the out of reach branch is located. Combine forked branch + knife=knife with handle +1. Use knife with handle on the out of reach branch to get curved thorns +1. Go down to the small cave by the beach. Time to eat: Go back to the small cave. Fire - Let's make a fire. 1. In inventory, combine flint + knife = lighter +1. Combine lighter +Amadou + driftwood = ready-made fire +1. 2. In inventory, use knife or rusty key on broken telescope to get lens +1. Combine lens + Amadou + palm trees = ready made fire. Place ready made fire on blackened ground. 3. Any combination of fire starter + items shown on #1 & #2 = ready made fire. Note: Spark + lichen + coal = fire + fire (zero points). When each fire is dismantled you end up with all kinds of extra stuff such as sharp flint, flint, 2 knives, lichen, amadou, coal, logs etc. Thanks, Daezie! Fishing rod - How about a fishing rod? Use the Acacia thorns on the fire - 'it bends the acacia thorns'. In inventory, combine forked branch + thin vine + curved Acacia thorns or curved thorns from the unreachable branch + worms = fishing rod +1. Now, a-fishing we will go. Go to the pool under the arched stone. Use fishing rod on the fish +1. Now, go back to the fire to cook and eat it. Yum! Cook the 4 turtle eggs and the 2 crabs. Dismantle the lighter on the dismantling area at middle left of the screen. Use knife on green coconut to get stripped coconut +1. Use knife on stripped coconut to drink the milk and eat the flesh. If you use the sandstone on the coconut, the coconut breaks and wastes it. Use knife on another green coconut to get stripped coconut +1. Do it on the brown coconut. Use knife on brown coconut to get stripped coconut +1 + coconut fibers +1. Use knife on oysters and eat until full health points are obtained and the health bar frame is closed. If you use the knife on the third oyster, it will break. You can always make a new knife using the sandstone and the rusty metal. You can also place the oysters in the fire and not break the knife (Thanks, Samantha!). You should still have the bird's egg but another one can be picked up later if you eat this one. Go up to the inland path and click on the logs. Go through the opening. The vibration and sound occur again. Look down and take the young palm tree +1 frond. Go forward once and be standing on a crossroad. Look down on the left and use knife on white flowered plant to get hibiscus fiber +1. Look up and see smoke rising from afar. Go forward to the smoke and see sulfurous water that is boiling but can be used to cook on. Turn around and see a snake. Dismantle fishing rod and use forked branch to hold the snake. Then use knife to take the medicinal plant +1 right of snake. Look up on the tree trunk above the snake. Use the knife on the gash on the trunk. Take rubber +1 from gash and the forked branch from the snake. Turn around and see 2 paths, one on the left and the other to go back to the crossroad. Take the left path. See a broken bridge and one of the posts that has the rope strung on it. Look down at left and see a dead animal. Use knife on plant and to take narcotic plant +1 that is useful for big animals only. See a building and the volcano across the chasm. Turn around from broken bridge and take one click on the left path back to the crossroad. Turn left and then forward on this crossroad. Monkeys - Hear an animal in distress. Go forward and see a scarecrow. Click on it to get 3 pieces of dirty cloths +1. You are standing on another crossroad. Pick up 2 oranges +2 and 2 lemons +2 from the ground. Look right from the monkeys and use knife on plant to get wheat grains +1. Look up and see attacking monkeys. Standing by the scarecrow, you will be out of range yet. There is no need to fight them but in case you feel like doing so: combine forked branch or wooden fork, if available+ rubber = slingshot +1. Then you can shoot at them. Continuously shoot at the monkeys and the more consecutive direct hits lowers the bar on top of the screen. Once the green line of the bar disappears, the monkeys get tired of shooting at you and leaves. +10. Bamboos and clay - Turn around from monkeys and go forward. Use knife to pick up bamboo, small shoots +1. Use knife on broken tree above where the bamboo shoots are to get 2 wickers, straw and willow bark +1. Pick up 2 bamboos, large pieces +1. Pan right, use knife on bamboo plants to get bamboo, medium piece +1. Pan right again, use knife on plant to get elderberry pith +1. Take clay +1 from the brown area by water that has big animal tracks. Turn around and go back to the crossroad. Windmill area - Go right and forward from crossroad by scarecrow. Let's ignore those monkeys, if they are still there. Go left on this crossroad now and forward to the end. Take the brick mould +1 from the steps. The steps going up to the windmill is broken. There's a monkey up there sitting on the dead tree. Take 3 pine kernels +3 from the ground. Turn around and see a vine that should be cut way up high. In inventory, use brick mould + clay = unfired bricks +1. Go back to the fire at the beach by going forward, left, forward, left, forward to cave. Use unfired bricks on fire to get 2 sets of bricks +1. Go back to the broken steps by the windmill and use the newly made bricks on steps +5. Climb up. Take metal fork +1, strong cloth +1 and copper coins +1 dislodged from box under the strong cloth from the ground. Read the inscription on the box. Found the red metal tinged with green. And the arch eroded into the cliff. Take wooden fork +1 from ground and grapes +1 from wall. Look up on the windmill and see that one of the arms does not have any cloth on it. Click the strong cloth on the broken arm but the monkey stops you from fixing the windmill. Try giving the monkey any fruits but he still doesn't trust you yet. Click on ladder of windmill and look around inside the windmill. Look up and notice that it is rusty at the top. Go down and 'ouch' step on a pickaxe. Pick up the pickaxe +1. Jep - Go forward to where the other monkeys are/were. The monkeys run away. Hear a cry. Go inside the broken shelter. See an injured monkey - you named Jep. He needs a clean dressing on his wound. Combine straw + thin vine = mattress +1. Click mattress on Jep. Turn around and see a pottery wheel on the left. Pick up the brick mould from the far table. Lake, post and Maple tree - Go back to the fork by the scarecrow and take a left to go to the next crossroad. Go right at this crossroad and note a pole that can has a hotspot at the corner. Go forward close to the water. See a maple tree on the right - a lizard scampers away from the syrup spout on the trunk. Go forward to the water's edge, turn right and use dirty cloth on water to get clean cloth. Do it to all 4 dirty cloth +4. Click on water to get a drink and click on it again to bathe. Click on water again to note that you need a container to collect water. Turn right and see bricks on the wall. Use pickaxe on brick wall. Too dark in there, you need a lamp or a candle. A lamp or candle can be made with seal fat and wick once a bowl is made or another method later in the game. Go back to Jep. Use clean cloth to bandage his head. Pot making - Go out and see that the kiln is broken. Let's fix that kiln with some of the bricks left over from the windmill stairs or make new ones with more clay + brick mold = bricks. Look at the sealskin bellows and see that it has a hole. Go forward to the scarecrow crossroad and forward to the end. Go to bamboo-clay area. Take more clay +1. Use clay + mould = bricks +1. Take more clay +1. Go back to Jep. Use clay on pottery wheel and click on wheel to turn it. Take unfired pottery. +1. Go back to beach. 'Hey what have we here!' Go forward and take the dead seal +1 on the beach. The fire at the small cave is not hot enough for the unfired pottery. Go back to the kiln by Jep. Pick up the logs +1 left of the kiln. Use knife on seal to get 2 seal fats +1, sealskin +1 and tendons +1. Use sealskin on bellows. Make fire. Use flint + knife = lighter. Use lighter + lichen + dried palm trees fronds = ready made fire. You can also try alternative method of making fire as shown at the small cave part of the wt. Use ready made fire in kiln. It's vibrating again. Use bellows and then place the unfired pottery in kiln to get pots +1. Make remedies - Go to the lake where you bathe. On the way, use the knife (after dismantling the lighter) on the maple tree gash. Use pot on spout to get 2 maple syrups +1. Go to the lake and use pot on water +1. Use water in pot + medicinal plant = remedy to heat up +1. Use pot on water again. Use water in pot + willow bark = remedy to heat up +1. Use pot on water again to get water +1. Go back to the kiln. Place the 2 remedies to heat up in the kiln to get 2 remedies +2. Give the 2 remedies to Jep. He will not eat until he has taken these remedies. Jep is feeling well enough to eat. Give the 2 Oranges, pine kernel and grapes to Jep. Use the knife on dried brown coconut to get stripped coconut and coconut fibers. Use knife on stripped coconut to get coconut strips +1. Give coconuts strips to Jep. Now Jep is restored to full health. Mina and Jep sleeps. Captain Nemo's ghost appears - 'find my body and give me a proper burial'. Jep is now in his special place in inventory. He can be used as an item on active spots - alone or combined with another item. Click Jep on bird's nest on the rafter above the exit to Jep's shed to get a bird's egg. +1. (Thanks, FinaLMakeRr) When you save and go back into the game you can go there and get another egg plus one point every time. (Thanks, daezie). Windmill - The monkey on the tree still will not let you fix the windmill. In inventory, click on Jep + any food available (pine kernel, coconut strips, grapes, oranges) = Jep offering present. +1. Click Jep with present on monkey on the tree. The monkey won't be any trouble. Use the strong cloth on windmill. Climb the windmill ladder. In inventory, combine Jep + seal fat. Use Jep holding lump of fat +1 on the top of the post of the windmill. The windmill now turns. Cake - Use wheat grains on container at base of the post. Take flour +1 from the bin below. In inventory combine: Flour + water + bird's egg (another egg is available later if this is not available now) + maple syrup + lemon = ready to bake cake +1. Place ready to bake cake in kiln = cake +1. Rope ladders - Go back to windmill and go down the steps to the right. Combine Jep + knife. Use Jep holding a knife +1.on vine hanging on tree to get Mina to make 2 rope ladders +1. Hanging bridge - Go to the broken bridge at the end of the left crossroad with the dead animal by going forward, left, forward, right and forward to end. Combine Jep + rope ladder and click Jep holding a rope ladder +1 on post with rope. Watch Jep make a rope bridge. Volcano farm area - Go across to the other side. Pick up the sulfur +1 beside the hot spring. Turn to the right and see a monkey with a stick. Jep might be beaten with a stick. Take the bamboo, large piece and drop it on the hot springs +5. It scares the monkey with the stick. Take coal +1 and broken cage +1 by the shelter. Go forward and take the iron sulfate +1 on the right. Turn left and take the potash +1 from the burned tree. Snake in a cage - Turn around and go to the snake by the other hot spring. In inventory: broken cage + wicker = cage +1. To catch the snake, use the forked branch on the snake and then click the cage on it to get a caged snake +1. Go forward until the beach. At the beach, go to the cliff side where the bird's nests are located. Click Jep on top nest. See an egg drop and a second later, feathers float down. Take feathers +1. Turn to the cliff. Combine Jep + rope ladder = Jep holding rope ladder. Use him on top of the cliff. Watch Jep climb and drop the ladder. Climb up to follow Jep. Granite House - Turn around and click on the inscription - Granite House 1860. Take bird's egg +1 left of the opening - you can use the egg to make the cake. Take diving suit+1, musical score +1 and mysterious key +1 from ground. See Captain Nemo's body. Pan left and see a pulley. Go forward, turn right and see candle or lamp holder at corner of the wall. Go forward, turn left to the shelves and take the planks +1 left of the shelving. Take 2 sets of iron fillings +1, screwdriver+1, hammer +1, nails +1 and roll of wire +1 from the shelves. Turn around and look down on chest. Click to open the chest and take the 2 cotton shirts +1 and 3 wicks +1. A shirt can be cut with knife to get 2 clean cloths +1. Turn right, look at cannon and take cannonball and hardened powder in a barrel. Look at maps on each wall. Learn that you are on Lincoln Island and how Granite house was built. Take photo +1 from bottom shelf. Take rods and tubes +1 from cracked container under the map above the table. Make note that the rods are made of zinc. Click on journal under the slab on top of the table. Read the words of Captain Nemo. The right side is torn and missing some parts. He states where he wants to be buried, repair his diving suit, ...kill you, aim at thruster... Read the left page and learn how to make several chemicals. We will do that later. Now, let us take care of Captain Nemo's last wishes. Go to entrance. In inventory, combine hammer + nails + planks = coffin +1. Use coffin on Captain Nemo's body. Click the rope of the pulley and then click on the coffin. See Captain Nemo buried. Mina! +2. Go to the stone arch. 'A present for you'. Click on post to get giant oyster +1. Use knife on giant oyster to see a large black pearl +1. Note: You will not get this cutscene and the points, if you already took this oyster earlier in the game. Go to the palm tree area and click Jep on the coconut up the tree +1. Pick up the green coconut. Go back up to Granite house. (If an irate monkey stops you from climbing the ladder - see the 'Monkey with a stick' under the Nautilus part of the walkthrough.) Let's read more about the chemistry notes. It has the procedure to make a Becquerel battery (potash, nitric acid, zinc strips and glass tube closed by malleable material), Volta Battery (copper, silver with cotton soaked in lemon juice), nitroglycerine (nitric acid essential. Distill sulfuric acid over saltpeter) and Sulfuric acid (calcinations of iron sulfate in closed vase). Go to the front room and place any light source (candle or oil lamp) on the corner wall of the room. Seal fat + wick = oil lamp +1. An alternative way is if you come in from the lake area in the forest, you can place the oil lamp there after breaking the brick wall. Go down the passage with wire strung on wall and pick up the gun +1. Turn around and pick up lantern - not working +1. Projector - Go back to front room and turn right to the once dark area. Take another lantern - not working +1, small amount of sulfuric acid+1, sulfur +1 and broken projector +1 from the shelf. Click on water to get bowl of water +1. Read the inscription on the wall. Turn around, see a table and a makeshift screen on the wall. Cavern -Hear the voice of Captain Nemo from the past when he was hurt by the monster. Turn around and look down at the hole on the floor - entrance to the cavern. Go down, pick air tank +1, helmet +1. and saltpeter +1, the white powder on wall behind the ladder. Click on water and a monster tries to swallow Mina and Jep. Go to the room after the cannon room. Pick up steel chain +1 from floor and charcoal +1 from bottom shelf. Look at the map on the wall. The closest land is 1200 miles away. Still - Pick up the boiler +1, Amadou +1, tank +1 and coil +1 further down the room. Combine tank + boiler + coil = still +1. Place still on top of fireplace. Use knife and flint to make lighter. Combine lighter or lens + Amadou + coal or log = ready made fire. Use ready made fire on fireplace. Alcohol - Click maple syrup on boiler. Click on tap of tank and take alcohol +1. The alcohol is an alternative solution for the cake or snake with the irate monkey. Always move the cursor on the fire to make the fire blaze. Nitric Acid - In inventory: combine sulfuric acid and saltpeter +1. Place the combined chemicals on the heated (fired) boiler of the still to get 3 batches of nitric acid +1. Sulfuric acid - Place iron sulfate on the heated (fired) distiller and take sulfuric acid +1 at the tap of the tank. Volta battery: This battery can be done earlier in gameplay. In inventory, combine clean cloth + lemon + bamboo, medium piece + silver coins + copper coins = Volta battery +1. Becquerel battery: In inventory, combine nitric acid + potash + clay + rods and tubes = Becquerel battery +1. This is an alternative to the Volta battery. Phone - You recharge the phone when one of the batteries is first made. In phone frame, click on news and click on left arrows to hear all the news about Mina's disappearance. The encyclopedia is now available. Get more saltpeter +1 behind the ladder at the cavern. Gunpowder - In inventory, combine charcoal + sulfur + saltpeter = (gun)powder +1. Hardened powder can be be used if it is processed in the windmill. Go to windmill, click the barrel of hardened powder on the container at base of the post. Pick up powder+1 from the bin on the floor. Pyroxylin - Combine clean cloth or elderberry pith + nitric acid + sulfuric acid = pyroxylin +1. Bow and arrow - In inventory, use knife + porcupine = quills +1 + porcupine carcas +1. Combine knife + young palm tree = incomplete bow +1. Incomplete bow + hibiscus fiber or tendon = bow +1. Feather + bamboo, small shoots + quills = arrows +1. Bow + arrows = bow and arrows +1. Gun - Combine gun + iron fillings + powder = gun and ammunition +1. Nitroglycerin - Place dried seaweed in fire and get soda +1. Combine soda with fat = 2 glycerin +1 + soap +1. Combined glycerin and nitric acid = nitroglycerin +1. Don't forget to use the soap on Jep so that Mina will give him a bath at the lake. +3. Dynamite - In inventory, combine wick + clay + nitroglycerine = dynamite +1. Slingshot - Forked branch or wooden fork + rubber = slingshot. Oil lamp - Seal fat + wick = oil lamp. Candle - Glycerin + boiling water = candle wax +1. Candle wax + wick = candle +1. Lantern - Charge the lantern not working with either one of the 2 batteries +1. This is the light source for the diving suit. Lightning arrester - Combine metal fork + steel chain = lightning arrester +1. Kite - Shirt + Wicker + Roll of wire = kite +1. The encyclopedia states linked to the ground by metal wire, this kite can attract a bolt of lightning. The kite can be combined with Jep and used on the pole close to the Maple tree in the forest-lake area. Go to the table by the hole to the cavern. Use the Volta battery on lantern - not working to get lantern. In inventory combine charged lantern + broken projector + lens (from telescope) + photos = projector +1. Place projector on table and then click on makeshift screen on wall. Watch the slide show +2. Use the arrows to scroll the slides. They made nitroglycerine, use Becquerel batteries and cannons. Go down the ladder to the cavern. Diving suit - In inventory, combine diving suit + air tank + helmet + lantern (charged) = diving suit +1. Laced bait - In inventory, combine porcupine carcass with narcotic drug = laced bait +1. Monster - Either shoot the monster with your firearm or throw the laced bait on the monster. Click it on the water. Dive in the water and automatically use the complete diving suit. See a vessel in the cavern. Read the plaque - it is the fabled Nautilus 1860. Climb up, look down on the red light. Click on red light on floor. The key stand rises. Oh no! Guardian robots! You escape back to Granite House. Look at the mysterious key in inventory and the encyclopedia states that the crystals do not have energy and should be replaced. Use the screwdriver to remove the spent crystal to get empty key +1. Now where can we find the crystals? Go to Captain Nemo's journal at the second room. See a guardian robot floating outside. Uh Oh! Read Capt. Nemo's notes and see that it is now complete. Learn why the island is invisible to the outside world and that the shield is affected by stormy weather. To destroy the robots - aim at their thrusters. The Nautilus panel code: 5401 (+1860) = 6261. Going to the Nautilus activated the guardian robots and they are out to get you. You need only 2 thrusters and 4 damaged keys. Each robot has to be killed using one of the available weapons for more points but is not necessary for the completion of the game. Any weapon can be used. The weak point of of the thruster is the middle part of each body. Robot at beach area outside the Granite House - The robot outside the Granite House can only be destroyed with the cannon. Open the cannon and place cannonball, lead fillings and pyroxylin or powder (from firearm and ammunition or hardened powder). Look close at the wick and see the target. When the robot enters the target and the thruster is at center, use the match on the fuse. Gotcha! +10. Go down the rope ladder. See an irate money drop the ladder. Pick up the rope ladder +1. Go forward on the beach and pick up the thruster +1 (no damaged key) by the robot destroyed by the cannon. The phone will ring. Click on the phone icon and listen to mom. The phone can receive but not transmit. Check the news and then the GPS - W:150 deg 30 S: 35 deg 57. Stone arch robot - Go to the stone arch and get bow and arrow from inventory (or any weapon of your choice). The robot is just outside the arch. Fire at it. Once destroyed +7, pick up the thruster +1 and damaged key +1. Broken Robot code puzzle: Go towards the path and see a broken robot on the path. Click on the blinking lights on its head. See a panel that has 2 sets of silver rectangles at top and bottom and with numbers in between. The aim of the puzzle is to get the red lights turn green. The top set of rectangles has letters on them while the ones at the bottom will show the number of the buttons pressed. If the correct numbers are pressed the lights at the bottom will turn green. Solution: Based on the position of the letters in the word NAUTILUS, press 1 for N, 2 for A, 3 or 7 for U, 4 for T, 5 for I, 6 for L and 7 for S. Any other letters - press 0. For example: if the letters above are V I N U, press 0 5 1 3 or 7. When correctly done the red lights turn to green +10. Pick up the thruster +1 and the damaged key +1. Taser panel puzzle: Go up the path and see there's laser beam blocking the way the inland-beach path. 1. Use the lightning arrester on the red laser blocking the path. You will use the it to pass through safely +5. Then turn around and solve the next puzzle. 2. Solve the panel puzzle: Combine Jep with screwdriver +1 and click him on blinking red panel. The aim of the puzzle is to get all the red lights green by making a continuous flow of current from the source on the right to the lights. Labeling the top vertical buttons (L-R) 1- 5 and horizontal buttons (T-B) 6-10. One possible solution is to click once on buttons 1, 9, 6, 7. When correctly done, the blue lights are off +10. Roped bridge robot - Go toward the hot spring area and see another robot close to the rope bridge. Go to pole by the maple tree crossroad. Combine Jep + kite, click Jep with kite on pole +1. Jep will fly the kite and the electricity generated will run through the wires and blast the robot +10. Go to the wrecked robot, pick up the thruster +1 and the damaged key +1. Or just use any weapon of your choice. Windmill robot - The next one is by the windmill, go from behind by going around Jep's shelter to go to the windmill and use the dynamite on robot from above +10 (or any weapon of your choice). Don't forget to take the damaged key +1 and thruster +1. Gotcha! Robot by lake area - Get the firearm, ready to fire from inventory (or any weapon of your choice). Shoot at robot. Once the robot is hit +3, pick up the thruster +1 and pick up the damaged key +1. Gotcha! Do this to all the robots. Go back to Granite House through the lake entrance. This event can happen anytime after you leave the Granite house. Monkey with stick - The irate monkey will block passage at the lake entrance.Give it either the cake or alcohol or scare it away with the snake in the cage +5. If you use the snake, the snake will disappear and the cage is left in inventory. In inventory, use the screwdriver on 5 damaged key to get 5 crystals +1. Place 4 crystals on the empty key to get a repaired key +1. Dive to go to Nautilus. There's a remaining guard on the deck. Get the bow and arrow ready, climb up and aim, fire! +7. Gotcha! Use the repaired key on the green slot of the key stand. There's a slight difference between the damaged robot code puzzle. See a panel that has 2 sets of silver rectangles at top and bottom and with numbers in between. The aim of the puzzle is to get the red lights turn green. The top set of rectangles has numbers on them while the ones at the bottom will show the numbers of the buttons pressed. If the correct numbers are pressed the lights at the bottom will turn green. Based on Captain Nemo's journal, use the numbers after the addition of 1860 to the shown numbers on the top panel. For example: 0013 (shown number) +1860 = 1873. Press 1873. +10. The hatch opens. Go down and find yourself in a cage. Look to the right and see a lever. The floor between the cage and the lever panel is broken. Click Jep on the lever but he might get hurt by the rusty metal. You call him back. Combine a thruster with Jep to get Jep hovering on a thruster +1. Click Jep on thruster on lever. The door opens. Go forward and down the stairs. The stairs is blocked by fallen walkway. Use 2 thrusters on the fallen walkway and it is raised. There are 2 door puzzles - either one can be done and get in to the center of the submarine, but do them both for score points. 1. Click on the fallen beam on the floor to move it over the walkway supported by thrusters. Walk on beam to the door. 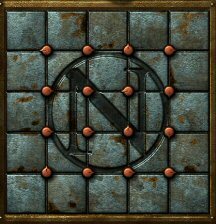 Middle Nautilus door code puzzle: The puzzle on the door is based on arranging the tiles that are in position and the fallen tiles to form an N. When correctly done, the door opens and look at the hole on the floor. You can jump down but will not be able to solve the other door puzzle. +10. 2. After finishing the middle door puzzle, go down the stairs and see another code puzzle. Lower Nautilus door code puzzle: There's a difference on this puzzle also. See a panel that has 2 sets of silver rectangles at top and bottom and with numbers in between. The aim of the puzzle is to get the 2 sets of red lights turn green. The rectangles are blank. If the correct numbers are pressed the lights will turn green. The numbers to be pressed alternates from top and then for bottom panel until all numbers are entered. On the top 1860 should be entered. On the bottom, click on a letter found on the word NAUTILUS. The door opens and see a robot. +10. The robot mistakes you for Captain Nemo. Before you talk any further with the robot, look around the room. Display behind robot: Combine Jep with clay +1 and click him on the display plaques that cannot be read. After that you can read the weapons behind the robot for answers. Desk - Turn around and walk to Captain Nemo’s desk. Click the map to see our location. Note the layout of how Lincoln Island is set upped. Read the letter to Captain Nemo from Jules Verne. Read Captain Nemo’s notebook. Find out more about the good Captain and the island itself. Hey look, a Mysterious Island first edition book by Jules Verne. If you could get that to e-bay. Safe puzzle - See a safe at corner of the room. 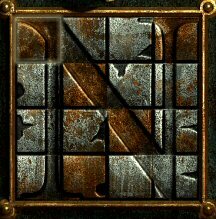 The object of the puzzle is to form Captain Nemo's insignia - N. Move the tiles by clicking on the red pointed buttons. The points of the buttons show the direction of the movement. +5. 1-4, 5-8, 9-12 and 13-16. The numbers in parenthesis are the numbers of times those buttons are to be clicked. There are 2 levers at bottom shelf of the safe. The left lever opens the view ports at either side of the submarine. Robot - Talk to Robot and find out that the tremors have blocked the entrance to the cave where the vessel is anchored. The rust has eaten the steering cable and the available energy is directed to the shield. The robot will lower the shield if you prove that you are Captain Nemo. Organ: The right lever at the bottom shelf of the safe opens the organ at other end of the room. Go to the organ and see the musical score that completes the music sheet that is in inventory. This is the music you hear you hear in the background played every now and then while checking things out. It is Captain Nemo's favorite music. Click the handle on the left side of the sheet of music to hear the organ play. The music played is missing the end part if you listened to the clue-background music. The last passage is translated as: 6 9 4 6 1 2 . But as Mordack found out in his reasearch about Captain Nemo: passage in Chapter 21 of "Twenty Thousand Leagues Under The Sea" ...."I descended to the drawing-room, from whence I heard some chords. Captain Nemo was there, bending over his organ, and plunged in a musical ecstasy....The Captain's fingers were then running over the keys of the instrument, and I remarked that he touched only the black keys, which gave his melodies an essentially Scotch character. " Labeling the organ's white keys (l-r) 1-9 and the black keys (l-r) 1-7: Click on 5 black, 7 black, 3 black, 5 black, 1 black, 2 black. +10. The robot will recognize you as Captain Nemo and will follow your orders. Quiz: You can also take the quiz. Click on the robot. Learn that if you pass a quiz the robot will think you are Captain Nemo and will follow your command. The quiz requires you to get 7 correct answers and allows 1 wrong answer. The questions are random and vary from game to game. Below is a list to help match questions to answers. Go to the front of the pearls. Click to move the fallen beam. From inventory place the pearl in its display position. picture of Captain Nemo and family on the door of the safe. The respected master of the greatest conqueror... Aristotle's The Poetic, 9th C Arabic Translation, rightmost top shelf at safe. white janthine-mollusk third from right on display case close to safe. Mina asks the guardian robot to deactivate the shield. Watch the departure of Mina. Note: This walkthrough has a score of 356.